Change is in the air. Not just that the inside the Beltway pundits are noticing that He is not all that He is cracked up to be. Not just that people are taking to the streets in protest. Not just that our European allies no longer are amused. Not just that the Chinese and Russians are worried that His economic policies may be too socialist. 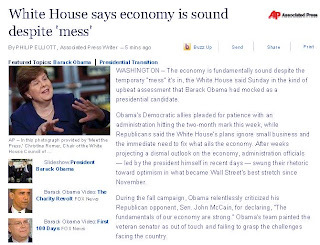 The economy is fundamentally sound despite the temporary "mess" it's in, the White House said Sunday in the kind of upbeat assessment that Barack Obama had mocked as a presidential candidate. Obama's Democratic allies pleaded for patience with an administration hitting the two-month mark this week, while Republicans said the White House's plans ignore small business and the immediate need to fix what ails the economy. After weeks projecting a dismal outlook on the economy, administration officials — led by the president himself in recent days — swung their rhetoric toward optimism in what became Wall Street's best stretch since November. During the fall campaign, Obama relentlessly criticized his Republican opponent, Sen. John McCain, for declaring, "The fundamentals of our economy are strong." Obama's team painted the veteran senator as out of touch and failing to grasp the challenges facing the country. But on Sunday, that optimistic message came from economic adviser Christina Romer. When asked during an appearance on NBC's "Meet the Press" if the fundamentals of the economy were sound, she replied: "Of course they are sound." Hey America. Remember that election? You've been punked. Remember all the "sky is falling" rhetoric to get the stimulus package passed? You've been punked. Remember "imagine hope"? You've been punked. Pretty funny. The One who shows the fierce urgency to mock others is being mocked. Speaking of being mocked take a look at Obama Channels Seinfeld and Next Time Call The Blogospheric Neologian, Not Wikipedia. And check out some of my other posts on where we are heading: A Cure For Social Security, The Revolt of the Kulaks Has Begun, The Last Bull Capitulates and Not Too Early For "I Told You So". And if you have the time, tell me Has My Blog Strategy Failed? UPDATE: Hat tip to Texas Eagle at Free Republic for these two video links to McCain's and Obama's comments that the economy is sound. If you actually believed Barack Obama wasn’t going to raise taxes on people making less than $250,000 a year, please slap yourself. Hard. I said months ago Barack Obama was elected on the most dishonest campaign in recent memory. "Magic mirror, tell me today. Have all my friends had fun at play? " Christine Romer reminds me of the Romper Room lady. I didn't believe in the magic mirror and I don't believe Christine. lacegrl130 - Your blog is very soothing. A nice remedy for this craziness. Congratulations on the 'Lanche, Professor! Thank you. Your blog is a welcome oasis of sanity from the destructive economic madness created by the Communist in the WH. Many Americans wanted a black president as though the color of his skin confers on him some magic, some wondrous witchcraft to do fabulous things. Though having some slight superficial resemblance to Obama (I'm the darker sister), I've stood against him from the time he appeared on the stage. Empty suit. Ignorant. America-hating. Communist. Racist. How could people not see? Yet, many blindfolded their eyes and with joyful acclamation agreed to destroy America. For, that is what a vote for Obama means. Keep on hitting him and telling the truth about him. Your blog goes on my Safari Bookmarks bar. Wow! Juba Doobai! I thank you for your observation. That opened a whole new way for me to look at this situation. Seriously. How could people not see? Was it mass hysteria, brainwashing or just willful projection? Good points and succintly expressed. Thanks. Thanks, William. Your blog is really informative. I can't blog this stuff - it makes my family crazy...but I am passionate and read, read, read and comment! I am so frustrated by all of this, you right wingers take everything out of context. McCain was at the time trying to ignore how bad the economy was and lived in a fantasy world, endorsing Bush's failed policies. What Obama said is totally different especially given that he has already clearly laid out all the problems we have. It really angers me to read such ignorance, as yours. Maybe if people like you guys had an alternative media outlet besides talk radio you'd know this already. I mean, I might as well be reading Limbaugh. But no... balancing talk radio is somehow not free, when in fact it is. bruce: "I am so frustrated by all of this, you right wingers take everything out of context. McCain was at the time trying to ignore how bad the economy was and lived in a fantasy world, endorsing Bush's failed policies. What Obama said is totally different especially given that he has already clearly laid out all the problems we have. It really angers me to read such ignorance, as yours." Hee hee. Inject political payoff money as stimulus = Magic Obama fix-all. Makes sense to me. Oh and I forgot the whole raising the taxes and saving money by selling out injured veterans. Yeah... Obama sure has a handle on things. No bruce, he was not trying to ignore how bad the economy really was...that is what you think he was doing. That is because you have to believe that to feel good about your support of Obama. And please, could someone for once tell me which of bushes policies we are talking about here that were failed. Am I to believe that you believe all of them were failed? More liberal shilling, no basis in reality. He had some failed policies, yes. But the policies that failed and caused whatever "crisis" we are in, were in large part implimented by dems in congress. Those same people are now given free reighn to push through more of the same..."failed policies". That phrase has long since lost it's maning however. Just about eerything out of this admin so far has been a failed policy, so if everything is, I suppose nothing is. "What Obama said is totally different especially given that he has already clearly laid out all the problems we have." Huh? He is aloud to say now that everyhing is hunky dory ONLY because he has already stated how messed up t all is? Do you know how twisted and irratonal that sounds? Yes, you will say that I took what you said "out of context" or some-such-nonsense, but when all you rely on for your arguments are democratic media and Obama admin talking points, i.e "I mean, I might as well be reading Limbaugh", you are going to end up sounding sophomoric, no matter what the context. And for the record, I have never listened to Rush Limbaugh, but anyone who thinks the Fairness Doctrine is fair or free is smoking some grade A liberal magic grass. If people wanted to listen to liberal radio, they would, and it would be successful. Take that logic in reverse...If liberal talk radio is not successful it means that...no one wants to listen to it! The government mandating that all conservative programs MUST be balanced by liberal programs is unconstitutional, and will ruin talk radio, the only media outlet that gives the conservative view point a fair shake. Will the Fairness Doctrine apply to TV/Cable and print media as well? Methinks not. What about you tube, you wanna regulate that too. Goodbye free speach, we hardly knew ya. Phony Outrage Over "Armed And Dangerous"
Is Barney Frank "Bad For The Gays"? AP: Richard Falk "Who Is Jewish"
Will Krugman Call Obama Narcissist-in-Chief? Who Is The Grand Master? Has My Blog Strategy Failed? What to Do About John C. Yoo? "My Success Did Not Cause Your Failure"
New Song - "It Ain't Your Money To Spend"
They Like Us. They Really Like Us Now.